If you love or are even mildly interested in sports than you know that today’s professional athletes have to worry about far more than just their game night statistics. Starting perhaps most prominently at the tail end of the Jordan era, athletes have become full fledged brands and are subject to living every aspect of their lives on- and off the court under a microscope. And because our celebrity-obsessed society can’t get enough and want to be updated 24 hours a day about what their favorite athletes are up to, there are people like Jill Munroe, the editor of JocksandStilettoJill.com, who give them exactly what they want. 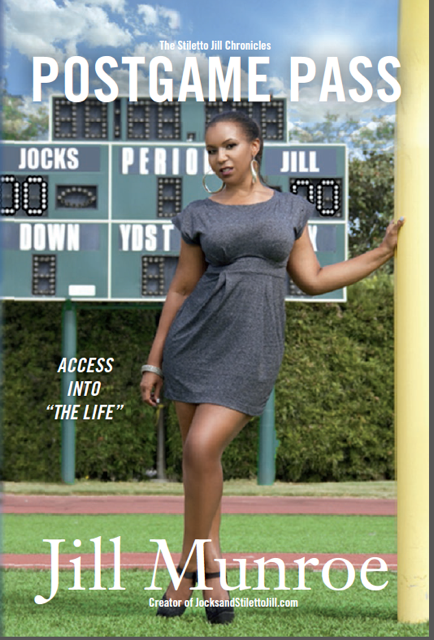 Created in 2009 to occupy her downtime during a job search, ‘JocksandStilettoJill’ is now a well-respected sports and pop culture site that leaves no stone unturned when it comes to delivering news on what moves athletes, their entourages, significant others and front office staffs are making at any given moment. Curious about how she’s managed to create such a reputable brand and stand out in the male-dominated world of sports, I recently connected with Jill to learn more about the site she’s been running full-time since 2011 and her first book PostGame Pass: Access Into “The Life,” which she self-published and released a few weeks ago. Hashtags+Stilettos (H+S): What inspired you to become a sports and lifestyle writer? What kind of work were you doing prior to getting into this business? 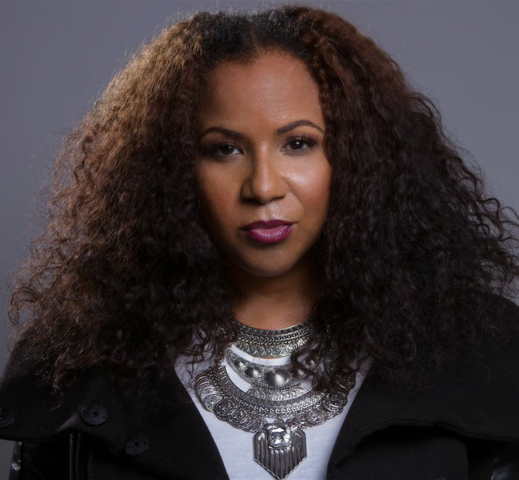 Jill Munroe (JM): I’ve always worked in sports and entertainment, for brands like Virgin where I was in PR, or as a brand marketing specialist for Nike. Those roles always incorporated lifestyle aspects. I was the go to person for trends, information, nightlife, etc. While working for a cable network, I was about to be laid off, so I was coming up with ideas to create a new role. One of my ideas was to create a column or the website that would cover sports and lifestyle topics. It didn’t happen [then] but, I decided to develop the idea into the [JocksandStilettoJill.com] website. H+S: Do you feel that you’ve ever been treated unfairly or differently as a woman in the sports world? JM: Absolutely. I’ve had men say that they aren’t interested in hearing about sports from a woman. Or, there are those that assume you’re in it to get close to athletes. The sports media world is comprised mainly of white males. Ninety percent of sports editors are white and/or men. Women and minorities make-up about 9 percent of sports media; most of which is at ESPN. JM: 2010 is [the year] I started making money from the site. I had a post that was linked on MSN.com’s homepage – it was something about Kim Kardashian and Kris Humphries. I received over 100,000 visitors in less than two hours and earned around $1,000. That changed my view about actually making a living from it. H+S: Has a celebrity ever reached out to you directly to complain about or praise a story you wrote about them? How did that go? JM: Generally, I’ve received nothing but positive feedback. I get really great feedback from my one-on-one interviews. I’ve also had the wife of [an athlete] reach out to me and thank me for bringing to light her side of a story. But, not everyone is a fan. I have been blasted on Twitter and the recipient of a few cease-and-desist letters and e-mails from lawyers. It’s all a part of being in media. H+S: Congratulations. You just released your first book called ‘Postgame Pass‘. How long did the process take? JM: I started the process two years ago, but I didn’t buckle down and start focusing until Summer 2014. I had to start actively scheduling time to write and to research. I had to take some time back from the site to focus and develop my writing. H+S: How does it feel to finally have Postgame Pass out in the world and what has been the initial feedback you’ve received on the book? JM: It feels great to see something you conceptualized finally come to life. It went to number one on Amazon’s hot new sellers in sports essays. That was exciting. Feedback has been great. A lot of people are saying they wished it was longer. Which is all good to hear because it’s the first in a series. H+S: You use a pseudonym, Jill Munroe, for the book and all of your JocksandStilettoJill work. Pseudonym use is a popular practice of many writers, but I’m curious to know why you chose to go that route? Are people surprised when they learn that Jill is not your actual name? JM: When I initially started the site, I didn’t have a plan for it. It was designed to [fill my] time while I was looking for my next job and to stay current in the digital space. It wasn’t necessarily going to be a platform to brand myself. But it sort of took off and I think in this age of Instagram handles and branding, people aren’t too surprised by [pseudonyms]. JM: Finding your own voice is key and to always keep learning. The research you do will pay off. Don’t be afraid to try new things. JM: I find that it changes as my career advances, but always be yourself, some of life’s best lessons come from failure, and as of late; learn to delegate. Your time is a precious commodity. H+S: Do you receive pitches for coverage from brand or athlete PR teams? If so, how do you prefer to be pitched? Phone/Email/Social Media? No Preference? JM: I prefer e-mail. I don’t mind initially being contacted via social media but details should be e-mailed, and phone calls should be scheduled if necessary. 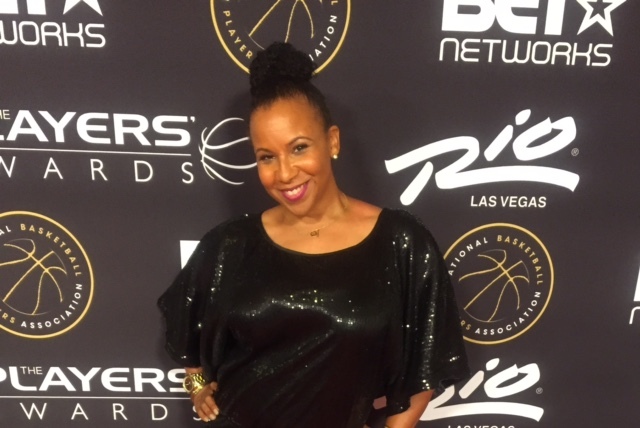 Jill at the inaugural NBA Players Awards in 2015. JM: JocksandStilettoJill.com is a sports and pop culture site, so I’m open to things that fall under that pretty broad umbrella. As long as it’s something that will engage our audience and has an interesting or unique perspective. H+S: When is the absolute worst time to send you a pitch? And, what are your biggest PR pet peeves? Same day pitches and failing to respect smaller outlets – because those views matter too. JM: Understanding that PR people also have a job to do and be honest when you [decide] not to cover something. I’m currently reading…“A Curious Mind” by Brian Grazer. My favorite book is…I have a hard time choosing favorites, so first I have to say “PostGame Pass.” The struggling creative in me says “The Artist’ Way” by Julia Cameron and for my marketing side “The Art of Seduction” by Robert Greene. I had the most fun writing or working on…I loved the four years that I worked at Nike, I was able to learn a lot in fun and creative ways, which prepared me for having my own company. In 2010 I had a podcast, producing and editing those shows was fun and then of course writing my book. I’m most proud of…That I was able to take a concept for my website and turn it into a lucrative business and that I pushed further to add author to my title. My dream interview would be with…Magic Johnson, Kobe Bryant and Serena Williams. iPhone, Android or Blackberry? iPhone LOVER for life. My 3 favorite mobile apps are…I know Twitter is lagging behind Instagram. But I love it. I enjoy the conversations better there. This technically isn’t an app but Notepad. I am always taking notes; things to use later, stuff I want to write about or products/brands I want to try. I also like Periscope for the livestream aspect. It’s like instantly having a talk show with feedback. I have plans for it this NFL and NBA season. I have…unread emails in my inbox right now…So here’s the thing, I have a pet peeve about unread e-mails. I can’t have it be more than 15-20 or it drives me crazy. My e-mail inbox is sorted by projects, companies, to do etc. I can’t let it get out of control. A fun fact about me is…Secretly I want to be a DJ. You can find me… @StilettoJill on every platform. Share this interview on Twitter and add #IWantThisBook to the Tweet. Two winners will be selected by 11:59 EST on October 2, 2015.